RTC Aftermath will come to you each night where our correspondents are at the conference tournament games as a part of RTC Live. Patrick Marshall is in St. Louis all weekend covering the MVC Tournament for RTC. Bradley won this game by hitting timely shots and wearing out the Salukis. The Salukis shot only 35% from the field and Kevin Dillard, one of SIU’s bigger scorers was held scoreless in playing all 40 minutes of the game. Patrick Marshall of Bluejay Basketball is the RTC correspondent for the MVC and Big 12 Conferences. He will be reporting from the MVC Tournament this weekend in St. Louis, Missouri. The Missouri Valley Conference finished regular season play this last week with Northern Iowa and Creighton sharing the MVC regular season crown. Due to the complicated tie-breaker formula, Northern Iowa received the 1-seed for the MVC Tournament and Creighton the 2nd. My preseason predictions weren’t exactly what happened, but like the whole bizarre Valley season usually is, the middle was all muddled up. No one expected Northern Iowa to be as good as they were in conference play and at the same time, it wasn’t expected to see Southern Illinois take such a nosedive so fast in the past two seasons. The MVC released their postseason awards on Tuesday with Booker Woodfox from Creighton getting the Larry Bird MVC Player of the Year honors. Woodfox leads the nation in 3-point shooting at 50.9% and averaged almost 16 points a game. Champ Oguchi from Illinois St. received the Newcomer of the Year award. I’m a little surprised that Bryan Mullins won the Defensive Player of the Year honors when he missed almost the whole last half of the conference season. Maybe it is a lifetime award or something. This Thursday night starts what is affectionately known as Arch Madness. I will be down in St. Louis covering things for Rush The Court with a planned RTC Live for at least one game each day starting Friday and other daily updates. I will also have all-access to the postgame news conferences and other media information. If you have things you want me to check out or have questions for the coaches or players – but I won’t be the guy that got kicked out of the Creighton game last weekend—then be sure to ask. The Missouri Valley Conference is part of the ESPNU Bracketbusters event once again this season. Matchups will be announced on ESPNU at 5:30 on Monday. With the struggles of this conference this season, it will be interesting to see how many TV games they get this season. The yearly battle in the Valley once again has shown some surprises. Is the Valley down this year? Hard to tell. Check out the teams this week and how they are doing. Osiris Eldridge, Illinois St—Osiris was just dominant this week in Illinois St’s blowout wins against Evansville and Creighton averaging 21 points and 7 rebounds per game. Illinois St. is still one of 6 undefeated teams in the nation and it has been his stellar play that has helped them dominate games and look almost unbeatable in league play so far. Maybe they will get that “Undefeated Season” they are talking about…well highly unlikely, but it is nice that they are willing to talk the talk. Evansville (2-0 this week)—I could easily put Creighton in this position after the big win against previously unbeaten Dayton, but Evansville has earned the recognition for what some would consider a surprising start this season. Their only loss is to Butler and they just destroyed Western Kentucky on Saturday night. Shy Ely and Jason Holsinger are leading this senior laden team. Evansville also gets to fight the big fish this week as they head to Chapel Hill to take on the Tarheels on Thursday night. So even if they are not the team of the week the rest of the season, it is deserved heading into this week. Creighton—Creighton kicked off the season a week ago against New Mexico and looked like they were going to suffer a big loss at home. However, they outscored New Mexico 40-16 in the final 10 minutes of the game led by P’Allen Stinnett with 30 points and Booker Woodfox with 26 points. Creighton also got a win against The Summit conference favorite Oral Roberts this past Saturday afternoon. The Jays may lose a little of their depth however as they go on a two-game road trip this next week with forward Justin Carter injuring his achilies on a thuglike play by Oral Robert’s Marcus Lewis. The extent of the injury is not known at this time. Guard Cavel Witter led the Jays in scoring in their other two games this week which makes Creighton a tough team to prepare for as several players can score. Southern Illinois— I was all set to give Southern Illinois the team of the week if they happened to win one of their games in Madison Square Garden this week in the Coaches vs. Cancer just because they were one of the host teams and put on the same level as Duke , UCLA, and Michigan. There was even a great behind the scenes look by Sports Illustrated on how the Salukis prepared for their trip to New York. However, the Salukis are a young team and could only play 30 minutes with the likes of Duke and UCLA. The Valley was on the national stage and laid an egg. I suppose realistically I expected SIU to be playing Michigan in their 2nd game which was probably winnable, so maybe I am being too hard on them. However, they did have a nice win against UMass this week before going to New York and have a couple emerging players in Carlton Fay and Kevin Dillard. Though they are 2-2 (or 1-2 if you don’t count the D2 win), they get a “Doing Well” for scheduling the way they did to be involved in this tournament. SIU’s next game is another road game against the always tough Western Kentucky. Evansville—Evansville is probably the surprise to start the season so far with a 3-0 mark as far as being undefeated compared to a few other Valley teams that are unexpectedly stumbling. However, they did get some nice wins against a middle of the pack Austin Peay and Oakland teams. Shy Ely and Jason Holsinger are leading the team as expected in scoring and team leadership. Ely had a double-double in the opener. Illinois St.—Illinois St. started the season on the road against a tough Wright St. team coming away with a victory and won the cupcake SMU Classic against low-RPI Alabama St., SMU and re-classifying first year Houston Baptist. The team is basically a bunch of players built around Valley POY candidate Osiris Eldridge and Oregon transfer Champ Oguchi. At least in the win against Alabama St. to kick off the SMU Classic didn’t feel like a win to Illinois St. and they are trying to improve. They rank high in my rankings right now just because they played four games this week. Hopefully the non-conference schedule won’t become an Achilles Heel come the end of the season. Missouri St.—Missouri St. started the season with a couple games on the road against Auburn and Central Michigan losing the Auburn game and opened the new JQH Arena against Arkansas with a nice win. Another blotch for the SEC. They have almost a week until their next game against Utah. 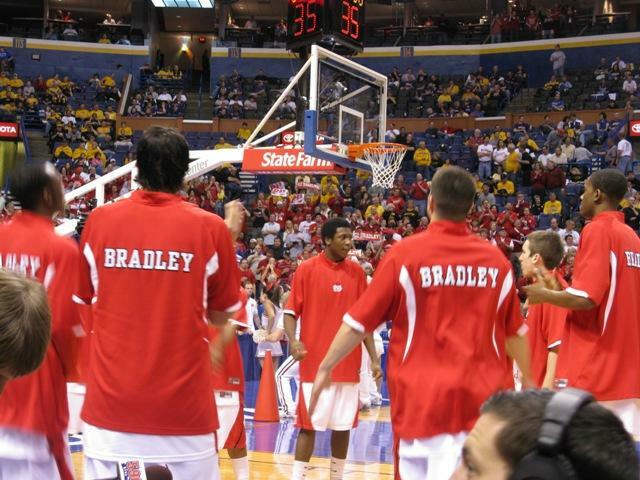 Bradley—Bradley started off with a nice victory over Illinois-Chicago, but then got blasted by Florida after a fast start made it look like they would be competitive in that game. Bradley was taking part in the CBE Classic as a last minute entry after the Top of the World Classic was announced it wouldn’t exist anymore late last summer. Bradley will be busy this week as they get the short end of the CBE classic and play 3 games in Ft. Myers against Florida-Gulf Coast, Richmond and UMKC Monday–Wednesday and then East Tennessee St. back at home on Saturday. Drake—Drake opened the season with new coach Mark Phelps and against a “rebuilding” Butler team and lost at home. Some Drake fans were already calling for Phelps’ head after one game. Just amazing. Then the team turned it around and beat Morehead St. and South Dakota St. The jury is still out on this team until we see how they do in Cancun this week. Northern Iowa—Northern Iowa is a team trying to recover from a slew of injuries as they struggled to beat a bad Denver team and then went on the road to lose at Illinois-Chicago at one point in the second half going 7 minutes without a field goal. The positive note is that Jordan Eglseder is recovering well from his injuries and is averaging 20 points and 7 rebounds a game so far while Johnny Moran is getting comfortable with the team. UNI started their Chicago Invitational games Sunday afternoon winning against Texas Southern. Wichita St.—This team has a lot to do after getting an opening weekend win against a Florida A&M team that was already beaten around pretty good by Kansas St. a couple nights earlier. Even though they remembered the bad loss against UMKC the year before, they went out and lost again to them this season, only it was at home. The sellout crowds at Koch Arena won’t like these types of things going on for long. Free throw shooting is something they need to improve on as they are 29-49 (59%) from the Free Throw line. They will be thrown into the gauntlet in the Old Spice Classic this coming week. Indiana St.—Indiana St. didn’t even play their first game until the 18th and lost at Northern Illinois 86-79. North Texas came to town on Sunday and beat Indiana St. as well. The team is having a terrible time adjusting to life without Marico Stinson who was their leading scorer and left the team just before the season. The Sycamores have a busy week ahead with 3 games on the docket including a game at Depaul. Southern Illinois vs. Duke and vs. UCLA—I was tempted to have the Creighton vs. New Mexico to be the game of the week since I was there for that one and the exciting comeback, but I think the bigger games were the Coaches vs. Cancer games involving Southern Illinois. 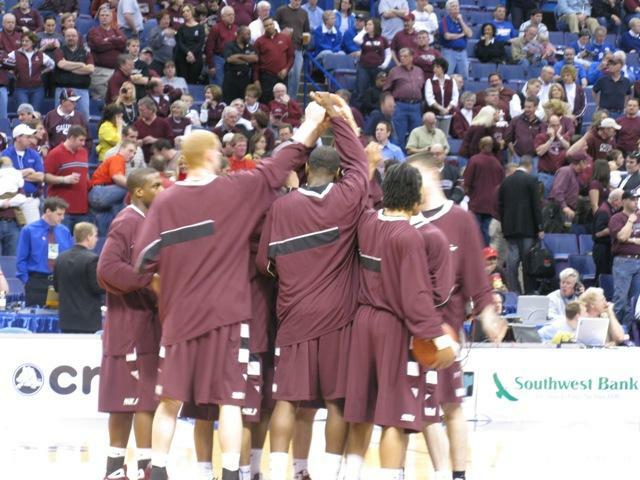 SIU played their down and dirty defense in these games and were in the games for most part. However, Duke got 47 free throws and UCLA got 26 free throws in the games while the Salukis only got 19 and 15 in both games which was the difference. Unfortunately for SIU and the Valley those losses may come to haunt them come the end of the season. But at the same time Davidson benefited from all of their “challenging” games that they lost last season and look how well they did. Josh Young, Drake—This was tough since there really wasn’t anyone in particular that stood out, but Josh was a scoring machine in the first two games for Drake averaging around 27 points a game including a 34 pt. performance against Morehead St. Shy Ely from Evansville, Jordan Eglseder from Northern Iowa and Cavel Witter from Creighton were also considered. 11/25, Creighton vs. Arkansas-Little Rock (Local Omaha TV)—This is a dangerous trap game that will give Creighton a good challenge on the road against the favorites of the Sun Belt. 11/26, Southern Illinois vs. Western Kentucky (Fox College Sports Atlantic)—Western Kentucky is always tough and another road test for the young Salukis. 11/27-30, Wichita St @ Old Spice Classic (ESPN Family of Networks)—Wichita St. gets a matchup against Georgetown in the first round with Siena or Tennessee the next day. Then with Oklahoma St., Maryland, Gonzaga and Michigan St., the Shockers will have their hands full, but a chance to turn their season a particular direction. 11/28 Northern Iowa vs. Marquette and 11/29 vs. Auburn in Chicago—Part of the Chicago Invitational tournament. 11/29, Creighton vs. Nebraska (Fox Sports Midwest)—This in-state rivalry is always a good game that packs the building and a chance for a win against the Big 12. I’ll be there for that one. 11/29, Drake vs. Vanderbilt in Cancun (CBS College Sports)—The SEC is down this year it appears, so Drake could steal a win here. 11/29, Evansville vs. Butler—Butler has been historically tough over the last few years, so this could be a good win for Evansville and a chance to stay undefeated. 11/29, Indiana St. vs Depaul—A chance to play a Big East team.